The Samsung Galaxy S II for AT&T runs Android 2.3.4 Gingerbread, wrapped in Samsung’s own TouchWiz UI. The latest version of the launcher, like we’ve told you before, is nothing short of impressive. We have prepared a video of it in action. The changes in TouchWiz 4.0, compared to its previous versions, begin at the very lock screen, which you can now remove by swiping in any direction, rather than just sideways. The cool feature where missed events (messages, calls etc) get their own unlock patterns is still here too. It has become evident, that the AT&T version of the Samsung Galaxy S II suffers a lockscreen security glitch. More about it, along with the remedy, can be found right here. The app launcher is improved as well. You can now create folders inside it (though given that folders are enabled on the homescreen we don’t see much use for that here). The notification area has been slightly redesigned in TouchWiz 4, but there aren’t any major changes to functionality there. The task manager, which Samsung has preinstalled, offers a lot of functionality. Now, with 1GB or RAM and with the new Gingerbread policy of keeping resource-hungry background processes in check, we are not sure you will need to enter the task manager all that often, but it doesn’t hurt having it. It also comes with a handy widget which shows you the number of active applications straight on your homescreen. With the Exynos chipset doing its magic inside, the overall user experience is pretty smooth on the Galaxy S II. For more on this, join us on the next page, where we’ll take a closer look at the dual-core Cortex-A9 CPU and the Mali-400MP GPU and their performance. 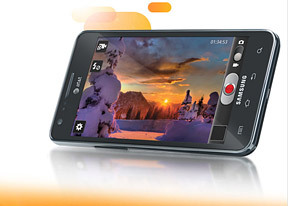 The Exynos 4210 chipset is where the Samsung Galaxy S II for AT&T gets its special powers from – just like the I9100. With a couple of Cortex-A9 cores, clocked at 1.2 GHz, and a Mali-400MP GPU to go with a healthy gig of RAM, this phone is nothing short of a benchmark monster. We’ve run a few benchmarks and the results are unsurprisingly good. Things are no different in with the browser benchmarks as you will see below. The Exynos chipset is still faster than anything else on the market. With higher clock speed versions of it in the Samsung pipeline, we suspect that its dominance will continue.